Whispering Corridors (Yeogo geodam, 1998) was released during a key time in the modernization of Korean cinema. It came one year after the breakout homegrown melodramas, The Contact (Cheob-sok, 1997) and The Letter (Pyeon ji, 1997) and a year before the first true Korean blockbuster, Shiri (Swiri, 1999). It was one of the early films in the new, prosperous era in Korean cinema, it was also the first horror film to leave a significant mark on the box office. While at this time horror films were similarly gaining traction in Japan, such as the Ringu (The Ring) and Ju-On (The Grudge) series, their Korean counterparts were very specific in their focus, which tended to revolve around teenage girls. Surprisingly, instead of being objects that were overtly sexualized and designed to incite lust, these characters highlighted the sensibility of sonyeo (girls). Choi argues that ‘sensibility’ “provides a conceptual alternative to ‘sexuality’”. Beneath this sensibility evident in Korean horror cinema, she believes that “one must uncover a collective fantasy: a form of female bonding and sexual performance that may or may not be socially sanctioned”. Audiences are given the opportunity to share a similar sensibility beyond their typical demographic. Instead of being drawn in by exploitation and sexual fetishization, they are led to empathize with the protagonists. The film is clearly a critique of the harsh Korean educational system but I think that the same things that point to this also act as metaphors for the larger issue of the whole peninsula’s shared historical trauma. The film is inherently violent, just like Korea’s bloody history, and yet most of the protagonists spend their time on screen internalizing their emotions and avoiding conflict. This contrasts strongly with male-oriented Korean high school films such as Friend (Chingoo, 2001) and Once Upon a Time in High School (Maljukgeori janhoksa, 2004), in which the protagonists constantly react physically and often incite violence. 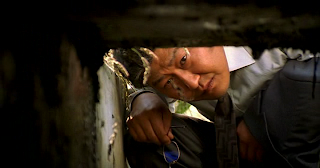 As mentioned above, the Whispering Corridors series as well as Kim Ji-woon’s A Tale of Two Sisters (Janghwa, Hongryeon, 2003) are examples of sonyeo sensibility, where the focus is on “emotional predilections and psychological behavioral dispositions and tendencies”, thus characters do not lash out physically. This style of cinema is well positioned to deal with Korea’s historical trauma. Since the nation’s grief is something that has never fully been resolved and had throughout the 1990s democratization and globalization of Korea been largely swept under the rug, it was a logical move to incorporate these buried anxieties and identity issues in characters that are typically dealing with their own grief which is quietly seething under the surface. Since the 1980s and still to this day, this position has been largely occupied by the post-traumatic males embodied by Park Joong-hun, Sol Kyung-gu and Song Kang-ho in films ranging from Chilsu and Mansu (Chilsu wa Mansu, 1988) to Peppermint Candy (Bakha Satang, 1998) to The Host (Gwoemul, 2006). When Korean cinema branched out to younger audiences in the late 1990s, this was a new way to deal with the nation’s history while also becoming more contemporary and drawing in younger (as well as foreign) audiences. The film starts by very clearly setting out its intent, with a young girl (only visible from behind and below the knees) looking up towards a school on a dark night. This menacing shot indicates someone returning to the scene of a previous trauma. The young girl's trauma is particularly important because of her age, she died young and was thus never allowed to grow old. Her trauma, that turns out to be her suicide, is all that remains of her. Her suicide was brought about by her treatment by the school’s teachers. The first victim is this narrative is an old teacher who feels that the past is about to catch up with her. She is also unable to forget the past and knows that it has come back to haunt her. The young girl embodies Korea and its battered past, or perhaps she could also represent a young victim such as a girl slaughtered during the Gwangju Massacre. Mrs. Park is the older generation which has also been scarred by the past and cannot move forward with these memories permanently etched into their psyches. The title Whispering Corridors refers to the gossiping girls who roam the schools halls. Perhaps it implies the growing awareness within the minjung (the masses), as they discuss current events and social injustice to the dismay of the authority that tries to eradicate any dissention by scolding the girls for chattering in class. "Either physically handicapped or psychologically traumatized (sometimes both), many of the characters emblematized the period's frustration when protest against the military government was disallowed." There is an evident progression of character representation if we trace the relevance of this statement from the start of the New Korean Wave, through its end and into modern Korean cinema. At the start, characters that fit this description were either college students or working class protagonists who had no chance to engage positively or successfully with society. Both of these character types, while worlds apart, suffered from an inability of expression and were both systematically oppressed by a government which tolerated nothing but uniformity and obedience. This began to change over time and in the year 2000, Peppermint Candy, arguably one of the last New Korean Cinema films, was released. In this narrative we follow a character's entire life story, although we do not engage too much with him personally as he is more of a window to see certain political events through. The trauma that his character suffers from emblematizes the many consequences of the social ills committed during the periods highlighted in the film. What is important, regarding the previous quote, is that he starts off with artistic and optimistic aspirations for the future but as his life becomes consumed and destroyed by the government and military he is eventually forced into civil service, where he becomes a detective and is broken down to become part of the system as he begins to reign his own oppression by beating people senseless under the guise of the law. Only in the end of the narrative (the start of the film as it plays in reverse chronological order) does he recognize what society has done to him and what he has become. At this point he removes himself from the tarnished society he admits to living in and being a part of. 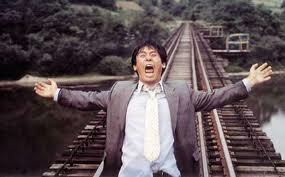 In Peppermint Candy the suicide of the principal protagonist at the beginning of the narrative very clearly spells disaster, when the character puts himself on the road (more specifically a train track here) and waits for the inevitable force of time and society to finish off his chronological narrative. His induction and subsequent denial of society left him with the knowledge that he had no home to go to and any attempt at recuperation would have been impossible. What happened in this narrative is that a character that started off by "emblematizing a period's frustration" with the government ends up with him becoming a part of it. The natural progression of this logic bings us to Memories of Murder which places the emasculated male as a part of the civil service (again a detective) right from the start and we are never given a clue about his background or why he may have joined the police. We do not necessarily see him as an oppressive agent, although he is certainly not wothy of much praise, but he is part of the system and he has no understanding of the consequences of most of his actions although to a cetain extent he learns to deal with this throughout the narrative. By the end, after suffering dificult psychological trauma he leaves the force (we do not know when or exactly why, although we can guess) to become a civilian. 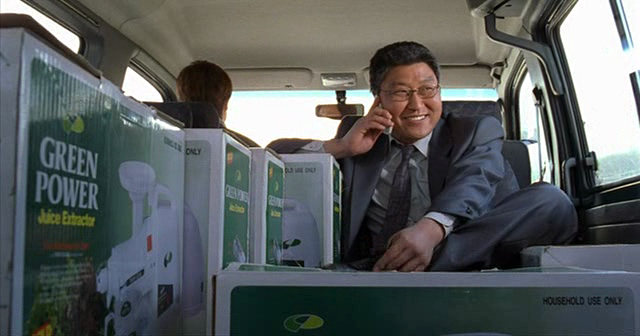 He becomes a travelling salesman, permanently doomed to travel the roads of South Korea. We last see him exactly where he started, still trying to make sense of something that has no easy answers on a road that seems long and narrow and may not lead anywhere at all. "The depictions of emasculated and humiliated male subjects set the stage for their remasculinization", this may not necessaily be true of this narrative but by rejecting his image as a civil servant or pawn of an oppressive government he has to some degree become engaged with his own narrative. He understands the society he lives in that much better and sees how he relates to it however, he is still far from recuperating his own male subjectivity, to quote Kyung "The dawning of a new modern era is normally punctuated by hope and optimism, but the weight of intense history and its attendant violence loomed so excessively large that it ended up traumatizing, marginalizing and denaturalizing men". The government and the history which it created was so vast and oppressive that, coupled with the pre-existing historical traumas from the rest of the century, it became impossible for post-traumatic males to be given any chance to heal their psychological wounds, within or without the civil service and the society it dominated. My work has been keeping me on the road recently and I am somewhat distressed to see that I have not added to this blog in over a month. Thankfully my workload has abated somewhat and I am once again in a position to contribute to my own project! Besides writing pieces on specific films and adding the remaining chapters of my Memories of Murder dissertation, I am also very keen to write some articles on different aspects of Korean cinema. I would gladly entertain expanding on any topics you may have in mind as I want this blog to become filled with discussion points, not just my thoughts. So I encourage you to suggests ideas in the comments section or you can email me. Finally, thank you all for reading my blog! I was delighted to see that Modern Korean Cinema has accrued over 1000 visits!